We consider the Maximum Weighted Coverage problem (MCP). We can relate the MCP to optimisation problems using submodular functions. Performance guarantees of the Swap Local Search algorithm are known for these problems, but can be improved for the MCP. 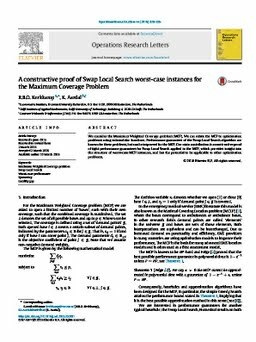 Our main contribution is a constructive proof of tight performance guarantees for Swap Local Search applied to the MCP, which provides insight into the structure of worst-case MCP instances, and has the potential to be applicable to other optimisation problems.